(4) finance using carbon credits. >> download flyer to learn more…. 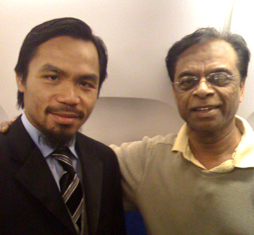 Manny Pacquiao with Dr. Prabhu Dayal collaborating to make electricity in his district converting farm waste to fertilizer & electricity. C TRADE generates electric power for pig and poultry farms in the Philippines using waste methane biogas recovered from manure collected in concrete tanks (anaerobic digesters) that also serve as waste water pollution control systems & produce fertilizer for sale. C TRADE develops carbon credits called Certified Emission Reductions (CER). None of the credits generated were sold, since the CDM system and market value for CERs crashed. However, these green projects are successfully operating generating electricity and organic fertilizer, and reducing carbon emissions, to combat climate change. C TRADE led by Dr. Prabhu Dayal has established itself as a premier international company with expertise for turnkey development of renewable energy projects to convert waste manure to biogas and electricity. Ctrade expertise includes the practical know how on the CDM process of the Kyoto Protocol. This includes advisory capacity to large companies, investors and government agencies on the pitfalls of using carbon credits or CERS (Certified Emission Reductions) for funding and the development of a better system in the United States through its directorship at EUEC – USA’s largest energy, utility, environment conference. C TRADE has developed various carbon sequestration and renewable energy projects in several countries since it was founded in 1998. C TRADE provides turnkey biogas-to-energy services, from project conceptualization to design, funding, construction, installation, operation, maintenance and training, under a Build-Operate-Transfer (BOT) scheme for large pig farms using our highly efficient biogas technology with zero waste water discharge. C TRADE designs and constructs turnkey biogas-to-energy projects for animal farm owners using waste manure to produce electricity and eliminate wastewater discharges. 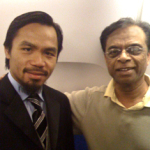 Ramesh Mohan, General Manager, C TRADE (India) Pvt. Ltd.
C TRADE Philippines, a branch office, of CTRADE USA was in first opened in Makati, Philippines with the assistance of the US Commercial Service to develop of biogas to energy projects at pig and chicken farms. C TRADE expected to maximize its expertise in this sector with over a million pig farms in the country. C TRADE has successfully used its proprietary biogas to energy technology at 8 biogas pig and chicken farms in the Philippines. We have successfully designed, funded, developed, constructed, installed, operated, trained, turnkey waste treatment facilities, using our biogas-to-energy technology, with onsite R&D at eight large pig & chicken farms in the Philippines. C TRADE Biogas technology is to harness and enhance a naturally occurring process (anaerobic digestion) to process manure and other organic wastes and produce biogas (~65% methane). This technology is a zero discharge waste water treatment system that reuses the water and sludge to make organic fertilizer for sale and provide electricity using biogas generators. Rod Robinson, Southwest Windpower Inc.
Philip Williams, CEO, hydroGEOPHYSICS, Inc.